Changing colors and falling leaves means it time again for the Green Bay Area Mothers of Multiples (GBAMOM) FALL RUMMAGE SALE. The Fall 2010 sale is planned for Oct. 22 & 23 at Resurrection Catholic Church on corner of Hilltop and Libal (in Allouez). Friday evening will be open for sellers and members only. Open to the public on Saturday 8:00am - 1:00pm. Over 15 families selling ALL kinds of baby/child related items! Lots of bargains! Invite a friend! 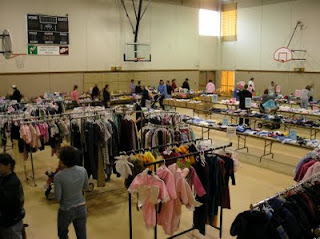 The GBAMOM Spring Rummage Sale was a HUGE success!! Thank you everyone who came to shop! Fill out the form below if you would like to get a reminder email for our next sale! Forget the snow on the ground... start thinking about camping this summer! 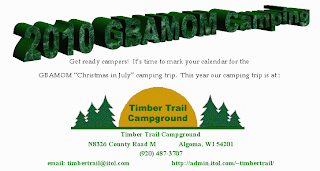 Mark your calendars and make your reservations NOW for the GBAMOM Camping Trip July 23-25. Click HERE for an information sheet. If you have any questions contact Malinda or Pat. Rentals available at Timber Trails: 60' mobile home stocked with absolutely everything you need -- linens, pots & pans, etc. It has 2 bedrooms and a hide-a-bed. It costs $95 per night for 2 adults and 2 kids with each extra person another $5 per night. Here is the extensive handout from the March meeting. Feel free to view it here or use the blue "print" button to print out your own copy! First, you would be surprised at how little time I spend cleaning and organizing. Once you get a good system in place, things just kind of take care of themselves. Little things make a big difference! And second, start small... don't try and do everything at once! Many of the photos you saw can be found here. They are from the blog posts I wrote about my once a year deep cleaning. While you're there... if you want to see the rest of my house, click the "Tour Our House" button. Take pictures to share with us as you organize! Post them to Facebook or bring them to a meeting to share!! If you have trouble printing from below, click to print from your web browser here. The current board term ends in April so we decided to have a little fun and get all the board families together. 17 are ages 8 and under!